Looking forward to experiencing nature in its wildest and most untouched form. With Kerala wildlife tour package offered by Rover holidays, arranging for a holiday in the lush forests, which are home to a variety of flora and fauna, has become easier. Explore the rich biodiversity of Kerala and spend time in the company of some rare animals and plants during your Kerala wildlife holidays. In our best Kerala tour package of 6 nights and 7 days you get Cochin sightseeing, Mararikulam sightseeing and Thekkady, it offers diverse attractions wildlife sanctuary, hill station, and spice plantation. Kumarakom, a place best known for the honeymooners. It is a cluster of little islands on the Vembanad Lake and make some beautiful memories. Book our Kerala tour package now. Take breakfast and then drive to Thekkady. 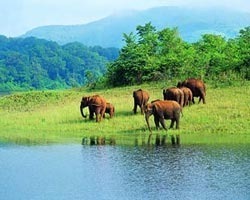 Thekkady offers diverse attractions wildlife sanctuary, hill station and spice plantation. Hence it has been very popular among nature lovers and adventure enthusiasts. Reach and check in the hotel. Freshen up and relax with comforts of your room. Evening view Kathakali & Kalaripyettu (Extra cost). Return to the hotel for overnight stay. After breakfast drive to Periyar National Park that is the most attractive feature of Thekkady. Enjoy wildlife cruise over the Periyar Lake to see wild life animals. You can also enjoy other delightful and exciting activities such as spice plantations tour and elephant ride. Do not forget to make a visit to local spice market for buying handicrafts and some garden fresh spices. Return to the hotel for overnight stay. After morning breakfast, checkout of the hotel at 11.00 am, and proceed to Mararikulam. Reach and check-in at the hotel.Marari Beach is an endless vista of sand and surf, but it is more. An authentic experience of the world Kerala's traditional fishing villages, and a recreation of an ancient, harmonious way of life. Marari originates from "Mararikulam ", one of the local fishing villages. Here life still goes on much as it did a hundred years ago, with the men going out to sea each day to earn a living bringing in the daily catch. Marari offers endless miles of superb sand beaches. The tourists can experience the local charm and traditional Kerala Hospitality at its best. Overnight stay at the Hotel/Resort. Enjoy the sumptuous breakfast with the new sunrise in Mararikulam. Later explore the beaches by playing with the sun-kissed shimmering sands and take a leisurely walk. The beach is known for nature's bounteous beauty with stunning backwaters, the tranquility of the village and the spectacular sceneries, glistening sands and the everlasting blue water will fill your soul and mind with joy. Overnight stay at the Hotel/Resort.